Hebrews 8:13(AMP): When God speaks of “A new covenant,” He makes the first one obsolete. And whatever is becoming obsolete (out of use, annulled) and growing old is ready to disappear. God requires that we grow up into Christ in all things (Ephesians 4:15). However, the law is incapable of bringing this kind of maturity. The law is the school master that LEADS people to Christ (Galatians 3:24); it cannot bring one into the measure of the fullness of the son of God (Ephesians 4:13). As revealed by our theme scripture, the law is ready to disappear [in regard to its relevance to the believer] to give way for a deeper relationship with God. But, there are people who are determined to fight for its continued importance to the new creature in Christ. I have known men who will do anything to keep legalism on their pulpits. The fundamental question is how different are you from the enemy who fought for Moses’ dead body? (Jude 1:9); of which, Moses is the representation of the law. God has not called us to fight for the life of the Old Covenant. It is obsolete, annulled and READY TO DISAPPEAR! Embrace grace, which is the access to the newness of life. Embrace grace which is the foundation of the new covenant. Embrace grace which is the power by which we mature. Embrace grace because it is the ministry of life. Embrace grace, which is the access to the newness of life. 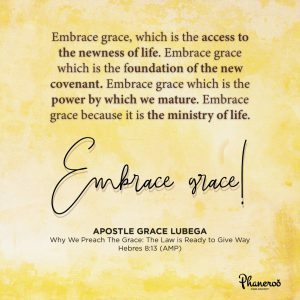 Embrace grace which is the foundation of the new covenant. Embrace grace which is the power by which we mature. Embrace grace because it is the ministry of life. Embrace grace! PRAYER: Dear God, I thank you because your grace is abundant towards me. It is my message and defines my conversations. By it, I minister life to everything around me. Today, I walk in a deeper revelation of it, I embrace it and yield my spirit to it. In Jesus’ name. Amen.